A dental implant is a small titanium screw that serves as the replacement for the root portion of a missing natural tooth. Dental implants can be placed in either the upper or lower jaw. Due to the biocompatible properties of titanium, a dental implant fuses with the bone and becomes a good anchor for the replacement tooth. Dental implants can be used in to replace single or multiple missing teeth. 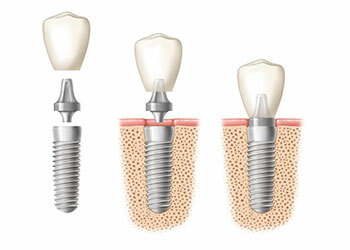 What is the process to have a dental implant? It is usually (but not always) recommended to wait at least 3 months after a tooth has been removed before the implant is placed. In some cases, there may not be enough bone to place an implant and a bone graft is required. This would be determined at the assessment appointment and may add to the cost. The actual procedure for placing an implant usually involves placing a local anaesthetic (injection in the gum, the same as when a filling is done or a tooth is removed). 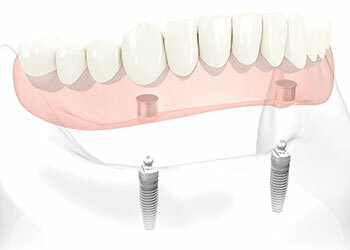 Once the gum is numb, there will be no pain but you will feel some pressure and vibration as the implant is placed. In some cases stitches may be used but not always. You may feel some soreness for a day or two but it is uncommon to get more significant symptoms. A "healing abutment" is placed on the implant and this is usually left for 3 months to allow the implant to fuse to the bone. 3 months later the "healing abutment" is removed, an impression is taken of the implant and teeth, and the dental lab would make a crown which is then fitted 2-3 weeks later. Usually no further injections are required during these stages. The fees quoted below are given as an indication and by no means definitive. The exact fees will be quoted at the assessment appointment. This is often one of the best options to replace a single missing tooth. 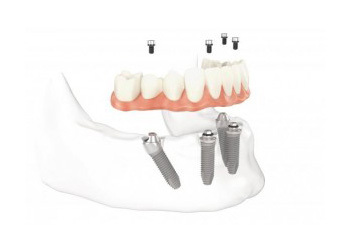 Unlike a denture, the implant is fixed, and unlike a bridge, it does not fix onto an adjacent tooth which may cause damage to this tooth, and also eliminates the risk of the bridge debonding and coming out. The cost is usually £2,500 in total (this includes the cost of the implant as well as the crown which is fixed to the implant). Loose or poorly fitting dentures can be stabilised by placing one to four implants in the jaw bone and using special "locators" to lock into the fitting surface of the denture holding them firmly in position. The number of implants required depends on the amount of jaw bone available. The cost is usually in the range of £2,000 to £6,000. 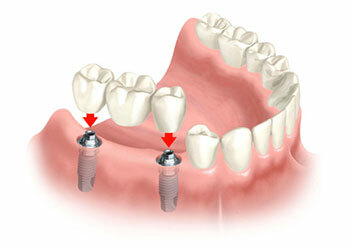 In some cases, two implants can be used to replace three or four teeth. This depends on the exact size of the gap and the quality and size of the bone available. The cost is usually in the region of £6,250 to £7,500. This system was created by Nobel Biocare and provides a complete fixed replacement for all the teeth in the jaw. The implants and a semi-permanent prosthesis are placed in one day so you would walk out with a fixed set of teeth. Six months later, once the implants have healed, a new permanent fixed prosthesis with a titanium framework is fixed to the implants. The cost is usually in the range of £16,000 and £20,000.